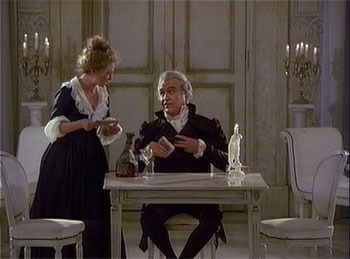 In 1988 Jean-Pierre Ponnelle made the last of his lip synched opera films; Mozart’s Così fan tutte. It carries Ponnelle’s trademark “artificiality” even further than in other of his films that I have seen. 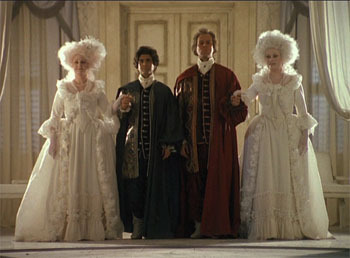 The sets, the costumes, the acting and the camera work never let us forget that this is a work of the, in the director’s words, “greatest artificiality”. It also becomes increasingly clear as the piece progresses that Ponnelle has a very clear idea of what “the opera is about”. 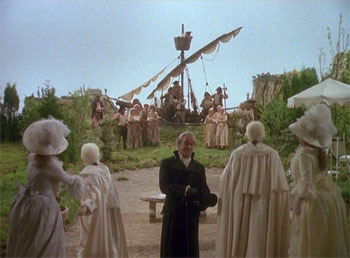 The symmetry of the cinematography is carried over into the overall concept. Fiordiligi are dressed, coiffed and made up identically. The visual symmetries are always Dorabella/Fiordiligi, Ferrando/Guglielmo, Despina/Don Alfonso. The pairs, and especially the sisters,are interchangeable to the point of being indistinguishable. As the drama plays out it is clear that Ponnelle’s message is literally “Women are all like that”. Towards the end of Act 2 he starts to really hammer it in. In Benedetti i doppi coniugi the “Albanians” have lost their silly hats and moustaches. It’s obvious who they are, which makes the panic at the return of the lovers entirely artificial and, ultimately, a bit creepy. Some real venom is injected into this scene too. The men are not reconciled or happy. They are, at best, merely resigned. Don Alfonso pays off Despina and thereby breaks the Don Alfonso/Despina symmetry. She is just one more puppet on Don Alfonso’s stage. They’ve all been had. Now it finally becomes obvious. Don Alfonso is Ponnelle and we’ve all been had. Suckers! Or to quote the lovely lemur, “What a shithead”. What of the performances? There is some amazing singing. 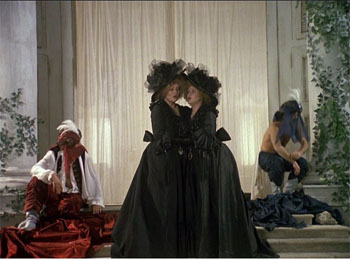 The sisters are played by Edita Gruberova and Dolores Ziegler and I just can’t imagine these role being sung better. Gruberova’s supreme technical mastery is well displayed in Come Scoglio!. Ziegler handles her big arias just as well and they blend gorgeously in the duets. Teresa Stratas is a fabulous Despina. It helps that she is tiny which makes her manipulation of the sisters so much funnier. And she really is funny as well as very accomplished. The men are a bit more mixed. Paolo Montarsolo is solid musically and appropritely arch as Don Alfonso. Ferruccio Furlanetto is not bad as Guglielmo and he has some very good moments near the end but sometimes he seems to be forcing his voice and it’s certainly not one of his best performances. The weak link is Luis Lima’s Ferrando. He sounds pinched and forced much of the time. He seems to be using a technique that might work in Puccini but sounds most unidiomatic in Mozart and his voice sounds seriously out of place in the ensembles. The Wiener Philharmoniker sounds as suave as one would expect and Nikolaus Harnoncourt is predictably idiosyncratic about tempi. The overture is taken at breakneck speed but there are some very slow tempi later on for example. Overall musically though, Lima aside, this is really very good indeed. The disk package is pretty decent. The sound options are DTS 5.1 created using DGG’s ANSI II technology, or the original PCM stereo. I found the DTS seemed to make the forced quality of the lovers’ voices even more pronounced and ended up much preferring the stereo , which is 1980s standard DGG studio quality. The picture is typical TV quality 4:3 which works fine as everything is well lit, rather stagey and often in close up do extreme resolution isn’t needed. There are Italian, English, French, German, Spanish and Chinese subtitles. There’s also a thirty minute rehearsal film which I didn’t find very enlightening. The booklet has chapters, a synopsis and a short but useful essay by Klaus Oehl. This is worth seeing for the women’s singing but it’s hard to resist the idea that Ponnelle is rather taking the piss out of us. This entry was posted in DVD review and tagged dvd, furlanetto, gruberova, harnoncourt, lima, montarsolo, mozart, ponnelle, stratas, wiener philharmoniker, ziegler by operaramblings. Bookmark the permalink. I should go dig this one up – maybe it’s time for a Ponnelle bender! That;s pretty much what I’m doing. All the Toronto Public Library Ponnelle’s showed u at the same time (like the 504 streetcar!). 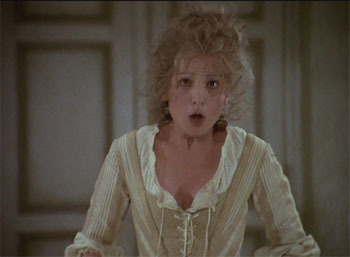 I started watching his 1972 Barber of Seville yesterday but it was a bit torpor inducing and I didn’t get very far.